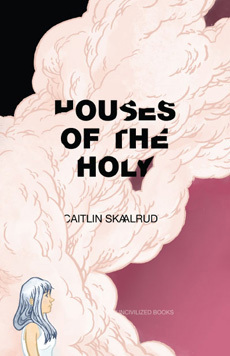 Caitlin Skaalrud’s graphic novel, Houses of the Holy, is a wild, surreal ride into its unnamed protagonist’s mind, full of vivid, dark imagery and poetic, lyrical prose. The concept is simple on the outside: an exploration of a woman’s life in as few words, but important ones, as possible. None of the characters in the novel are ever named, but there are a few clear characters to note: the protagonist who goes on this journey, a woman in a bride’s dress who makes several appearances in the beginning and end, and a young girl. There are several ways to interpret this novel. Everything is an abstract, dream-like object, the novel’s picture giving off a dark, macabre vibe from the tree topped with dismembered donkey heads to the forest filled with hung up photos of intimate situations surrounding the protagonist as she walks through. 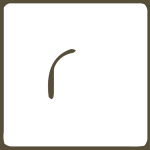 There is a lot for the reader to digest meaning from. The images get progressively darker and darker, and then for a brief moment the white space envelops the page and things become brighter again before the heroine undergoes a final descent into the dark pits of her psyche.  The changing colors help show the shift in the narrative’s tone. I thought you had loved me. You had fooled me. As you shook, I screamed liar, liar, liar. You backed away laughing, happy to go. Could you hear me then? Was that my voice, calling you back? Sweetheart, sweetheart, sweetheart, please. The prose is eloquent and, aside from a couple of grammatical errors, helps confuse and entice the reader further. On occasion, the meaning may get lost in the surreal beauty of the images, but what makes it great is that there is no one interpretation of what the heroine encounters. Despite the lack of dialogue and direct character interaction, a clear character arc of acceptance can be seen. The images she uses help portray the breaking that has incurred in the heroine’s heart and mind. Images of death and life fill the pages from cover to back. It’s a very visceral journey, slightly unhinged from reality. Anna Krenz is a fiction writer and occasionally a poet, hailing from Wisconsin. She is currently a senior working on her bachelor’s in Creative Writing and English at Hamline University. She loves writing in any genre, although fantasy and horror are her two loves. Besides cats, of course.